The volume of a 3-dimensional solid is the amount of space it occupies. Volume is measured in cubic units ( in3, ft3, cm3, m3 etcetera). 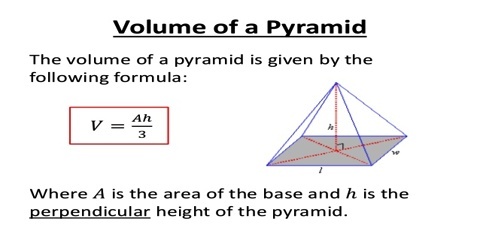 The volume enclosed by a pyramid is one third of the base area times the perpendicular height. A pyramid is any shape that goes up to a point at the top. The base can be any shape, but when the base is a circle it is called a cone. 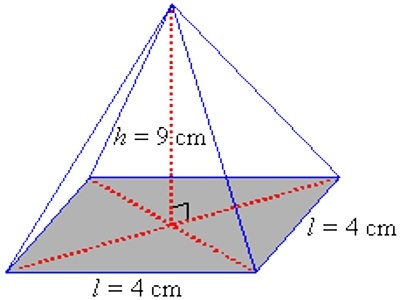 where, ‘a’ is the area of the base and h is the height of the pyramid. 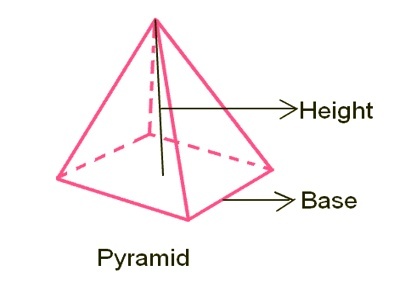 A pyramid has a square base of side 4 cm and a height of 9 cm. Find its volume.